From a North Carolina family, many of whom worked as spinners in a wool mill, Kenneth Lanier Wood became a major-league baseball player and later went into the insurance business. Wood, a right-handed outfielder who stood an even six tall and was listed at 200 pounds, was born in Lincolnton, North Carolina, on July 1, 1924. He was the eighth of nine children born to Oscar B. and Mary (Wingate) Wood. Oscar worked as a spinner in the Leaksville Woolen Mills. In 1930, the year Ken turned 6, the family lived in Paw Creek, somewhat between Gastonia and Charlotte. The eldest three – Robert (19), Bessie (18), and William (16) all worked as spinners in the mill that year. At the time of the 1940 census, Oscar Wood was still employed as a spinner. The three eldest Wood children had moved out of the household, but the next four in line were also all working in the woolen mill: Ethel in the packing room, James as a weaver, Laura as a spinner, and Helen as a blanket inspector. Ken attended Paw Creek Elementary School and Central High School in Charlotte. He played baseball and basketball all three years, and some football. He signed professionally with the Charlotte Hornets, who – some stories held – had outbid the St. Louis Browns for his services.1 Existing – and incomplete – records show Wood getting one hitless at-bat for the Hornets in 1941 and going 4-for-14 in six games for the Springfield (Illinois) Browns in the Three-I League. Both were Class-B teams. His pro career seemed to start more in earnest in 1942 in the Browns system, when he played for the Huntington (West Virginia) Jewels in the Class-C Mountain State League. He batted .318 with 25 home runs. His 126 RBIs led the league. In 1943 he played for three teams: Toledo for two games, and then two teams in the Philadelphia Athletics system – Elmira and Wilmington (Delaware.) He appeared in 72 games for Elmira (Class-A Eastern League), hitting .233, and 30 games for Class-B Wilmington, batting exactly 100 points higher, .333. He played in three locations, all in the Browns system, in 1946: class B Spartanburg (21 games,.230), AA San Antonio (76 games, .296), and AAA Toledo (27 games,.229). In his last at-bat for Toledo, he slugged a home run to break a ninth-inning tie. In 1947 he was leading the Eastern League in home runs with 23 when his contract was purchased by the Browns, calling for him to report to the big-league team in the spring of 1948. He was edged out for the home run title, but he drove in 96 runs and was named to the league All-Star team and. Wood opened the 1948 season with the big-league club, and debuted in St. Louis with a pinch-hitting assignment on April 28. He reached on an error by the second baseman. He pinch-hit again the following day and struck out. In his third assignment, he started the May 8 game for the Browns at Boston's Fenway Park. He reached on an error his first time up, but then tripled in the top of the third, driving in Whitey Platt. He bunted as a sacrifice, advancing two runners in the top of the fifth, hit a run-scoring sacrifice fly in the seventh, and singled in the ninth. He was 2-for-4 and booked both his first base hits and first RBIs. He played in six more games in May, with 15 more plate appearances, but failed to get another hit. On June 6, batting .083, he was optioned to San Antonio. There he appeared in 96 games, hitting .247 but with 19 home runs. Wood started the 1949 season with the St. Louis club, this time appearing in seven games but without any hits at all. In mid-May he was sent to the Baltimore Orioles (International League), where he hit for a .283 batting average, with 32 homers and 98 RBIs and was again an all-star. He worked in the off seasons as a mail carrier. He finally stuck in the majors in 1950 and for the two years after that. 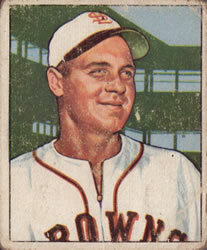 In 1950 he appeared in 128 games for the Browns, 88 of them in right field. He only hit .225, however, not a level of production expected of an outfielder. He hit 13 home runs and drove in 62 runs. For some reason he garnered two points in the voting for MVP, but was well-outdistanced by Phil Rizzuto's 284 points, which included 16 first-place votes. Wood ranked 29th. He struck out 58 times. He recorded 16 assists, throwing out six runners at home plate. There was one notable game where he accomplished something very unusual. On August 11 the Browns held a 2-1 lead over the visiting Tigers, Detroit had runners on first and second and nobody out, Wood fielded a single to right field and threw out the lead runner at home plate, earning himself an assist. The other runner took third base on the play, and then tried to tag up and score on a fly ball to right, but Wood's throw to catcher Sherm Lollar cut him down at the plate, too.5 The game he maybe took most satisfaction in came on September 13 in St. Louis when his home run in the bottom of the ninth gave the Browns a 4-3 win over the Philadelphia Athletics and extended the Browns' winning streak to seven games, their longest winning streak in six years. Three days later he hit another homer for the game-winning hit against the visiting Red Sox. Wood played in 109 games in 1951. He hit .237 with 15 homers and 44 RBIs. The 15 homers ranked him first on the last-place Browns. The 44 RBIs were topped by only two Browns. One of Wood's best days was on June 30 at Comiskey Park, playing the White Sox. He hit a two-run homer and later drove in another run, producing the last three runs in a 4-3 win. At the end of the season, he was part of a November 28 trade in which the Browns sent him and Gus Niarhos to the Boston Red Sox for Les Moss and Tom Wright. The Boston Herald's Arthur Sampson dubbed Wood a "strong throwing outfielder…owner of one of the strongest throwing arms in baseball. "7 He hoped Wood's offense would be helped by Fenway Park's close left-field wall. With left fielder Ted Williams called back to the Marine Corps for the Korean War, the Red Sox needed to bolster their outfield. Manager Lou Boudreau foresaw Wood playing right field, shifting Clyde Vollmer from right to left, if Williams was gone.8 Wood wasn't the answer. Faye Throneberry, age 21, took over for the most part. Wood appeared in 15 games, with 20 at-bats, and only mustered two singles. He neither drove in a run nor scored one. And in only nine chances in the outfield, he committed an error. He played with the Nats in 1953, too, for a while, starting as their left fielder for the first seven games of the season, then pinch-hitting in five more games over about four weeks from April 23 to May 23. One of the best catches of his career came on Opening Day in D.C. when he caught the ceremonial first pitch from President Dwight D. Eisenhower. Ike's first pitch apparently struck umpire Bill McKinley in the seat of his pants. Hitting .212 on May 26, he was traded to the Brooklyn Dodgers for left-handed hitting outfielder Carmen Mauro. The Dodgers sent Wood to their Triple-A team in Montreal. Even there, he didn't hit well, batting only .235 in 95 games. The Montreal Royals, however, won the Little World Series that year. In 1954, soon after the season began, he was purchased outright from Montreal.13 He had a bit of a rebound, getting into a combined 135 games for the Richmond Virginians (and Montreal) for .276 with 71 RBIs. His 19 outfield assists for Richmond led the league. Wood had two more years left as a player. In 1955 he was with Richmond again, playing in 128 games but batting for a poor .218 average. His final season was in Single-A ball, for the 1956 Charlotte Hornets in the South Atlantic League. There he hit .267 with 17 home runs, but it was the end of the line. In addition to the sources noted in this biography, the author also accessed Wood's player file and player questionnaire from the National Baseball Hall of Fame, the Encyclopedia of Minor League Baseball, Retrosheet.org, Baseball-Reference.com, Rod Nelson of SABR's Scouts Committee, and the SABR Minor Leagues Database, accessed online at Baseball-Reference.com. 1 Pap, "Sport Slants," Charleston News and Courier (Charleston, South Carolina), July 21, 1941: 7. 2 Wells Gaynor, "Second Guessing," unattributed newspaper column dated 1941 found in Wood's Hall of Fame player file, almost certainly from the Charleston (West Virginia) Daily Mail. 3 Ray Gillespie, "Ken Wood Guards Plate from Right Field," The Sporting News, November 29, 1950: 6. 4 "The Dope Bucket," Daily Illinois State Journal (Springfield, Illinois), March 25, 1943: 12. 5 Ray Gillespie, "Ken Wood Guards Plate from Right Field," 5. 6 "Rex Retires 6 Men in Row," Omaha World-Herald, March 9, 1951: 48. 7 Arthur Sampson, "Niarhos and Wood Come To Red Sox," Boston Herald, November 29, 1951: 14. 8 Joe Cashman, "Boudreau's War Cry – 'Don’t Count Sox Out'," Boston Daily Record, February 15, 1952: 53. 9 Mike Gillooly, "Piersall Wins Rightfield Fans," Boston American, June 9, 1952: 53. 10 Monahan, "Lou Sees Wilson Better at Defense Than Wood," Boston Traveler, June 9, 1952: 30. 11 Burton Hawkins, "Second-Division Spot Awaits Nats Unless They Win Tonight," Washington Evening Star, June 9, 1952: 18. 12 Burton Hawkins, "The Baseball Beat," Washington Evening Star, December 7, 1952: 79. 13 Steve Guback, ""Virginians Buy Outfielder Wood from Montreal," Richmond Times Dispatch, May 14, 1954: 42. 14 "Kenneth L. Wood," The Sun News (Myrtle Beach), November 24, 2007.